The car I'm working on is a 1991 z28, coupe, 5.7 auto. The donor parts are from a 1991 firebird formula 5.0. I've seen numerous swaps for the past year on the forum but I don't see much on the wiring. Is it because it's as simple as wiring the purple and yellow wires for the Neutral safety switch at the shifter to the purple / yellow wire that comes from the clutch pedal ignition lock switch? Also what switch goes on top of the clutch pedal? I'll follow up with a picture of that, of where a switch should go and I don't have. I also remember reading that after the swap if you don't give the hatch switch in the center console ground from ?????? The hatch switch will not work without you pressing the clutch, is that true? 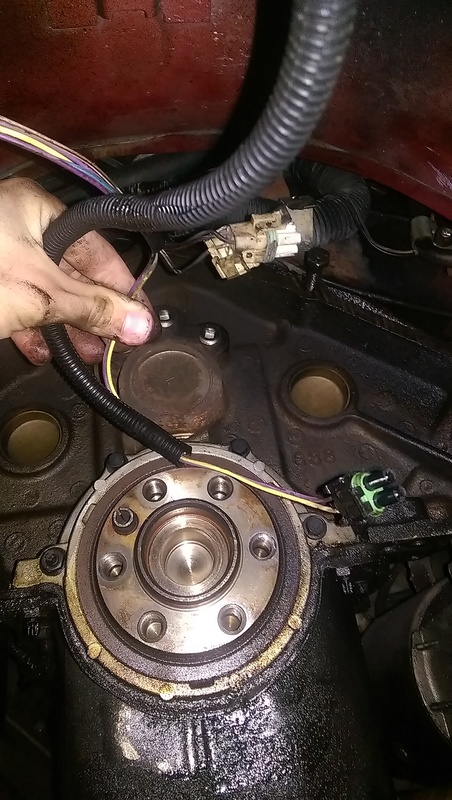 Picture of the clutch side, what sensor goes here and how and where is it wired to? 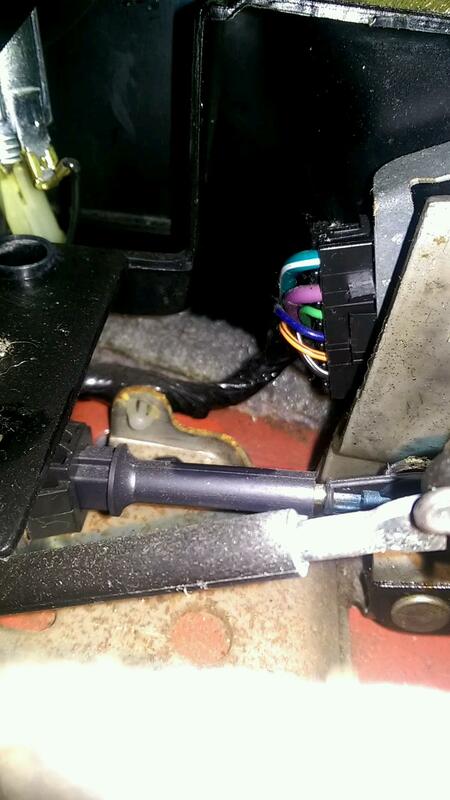 I'm looking at the service manual hunting a slightly different problem but yes I can see the "clutch start switch" is the yellow and purple wires. FYI drkblu and ltgrn is backup lights. My quick ciphering of the hatch release schematic appears that the release isnt supposed to work unless the park brake is engaged. Should be tan/white from release switch to parking brake switch with other side of brake switch connected to ground. The "sensor" on the clutch pedal is cruise disengage. Is there a thread that I can go to see the write up on this? Wiring write up. I'm not finding it in the forum. My mechanic did the swap, I can vouch that the power hatch will only work if the clutch is fully depressed, doesn't matter whether the car is running or not. 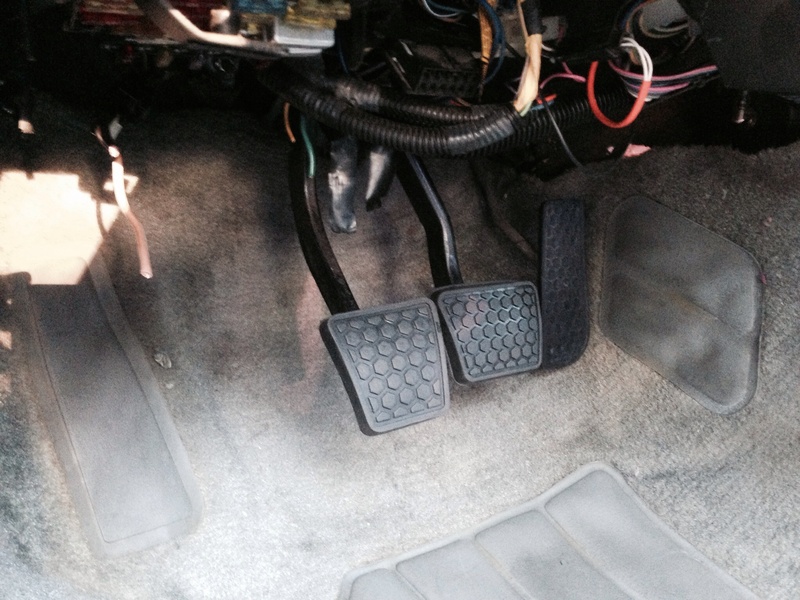 The two switches that are mounted on the pedals are for the brake lights and the cruise control. I'm still trying to figure out why cruise isn't work, I'm thinking it's the lever switch itself. The purple and yellow wires are pretty straight forward. I also remember getting a part so the reverse lights work also. Yeah it's either cruise or neutral safety switch. I dont have cruise and just bypassed the NSS entirely so Im not sure which. Last edited by InfernalVortex; 08-29-2014 at 03:18 AM. The car won't start,,,,,, what a pain in the a$$. After all that work, nothing, the radio turns on, everything else turns on except for the car, it won't turn over, nothing. As for as all I have read, yellow / purple wires from the clutch pedal to to the yellow / purple that goes to the auto shifter, neutral safety switch right??? The transmission has two plugs, one fit (believe it's the speed sensor??) and the other doesn't fit but thought that those wires would only help you with back up lights, correct? I left those alone for now. The car turned on before I did the swap,,. Suggestions on trouble shooting would be appreciated. The neutral safety switch wires are the two really big ones.... are you sure they're connected? If everything works, it just doesnt turn the starter, it sounds like a NSS issue... but who knows. Maybe you bumped something somewhere. 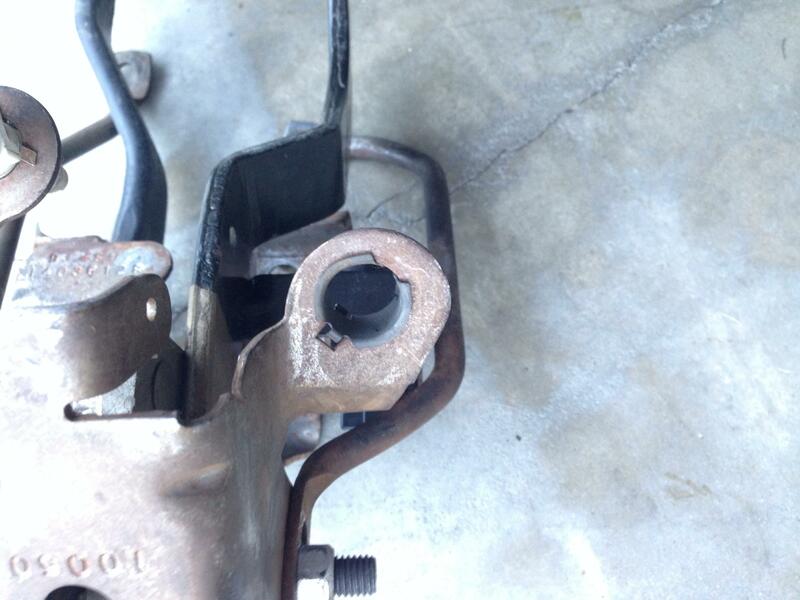 you said you ran the NSS wires to the clutch... are tehy properly attached to a new neutral safety switch? is the neutral safety switch getting properly activated when you push in the clutch? An easy way to know if it is the safety switch causing your issue is to install a jumper wire in the connecter and if it starts then you know it is the switch. I had a car that the switch went bad so the previous owner bypassed it by jumping the connector. Me being a stickler for things being done right adjusted the switch and hooked it back up. Sorry for hijacking the thread but I am in the process of finishing up my ls1 t56. The car before was auto. 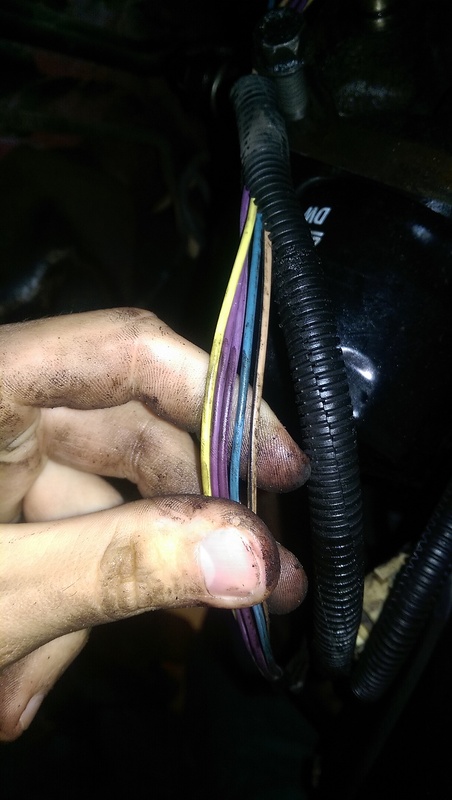 What I am understanding as I read all these threads is you run the two thick wires to the clutch so it would need to be engaged to turn on the car? I'm using 4th gen pedals and safety switch. your fourth gen pedals may have come with a smaller gage neutral safety switch that is not designed to connect to the starter wires directly. my swap required use of a relay to engage the starter with the neutral switch. third gen neutral switch is heavier gage and capable of direct connection. two (biggest wire) Yellow and Purple go to the clutch pedal switch. Just match the colors, this makes it so the clutch has to be pushed in to start the car. -The next two Blue and Green wires in the harness go to your reverse lights, wire them to the two wire connector on the passenger side of the T56. I was missing the pigtail, so I cut the one that went to the automatic and used it. -The next two wires Black and Orange, tape up and aren't used. They signal the computer that it's in park and neutral. We want it to think it's in drive all the time. Looking closer at the thread I just mentioned makes it look like it's talking about wires inside the car attached to the auto shifter but even when I looked in that area I didn't see anything like what I've read about.